Flesh Wounds is a portrait of an American family in crisis. When the police come to arrest Hal Lamm, a Minneapolis salesman, for abusing his 13-year-old granddaughter Becky, his entire family must come to terms with its secrets and unhealed wounds. Hal's wife Phyllis, after decades of denial and emotional estrangement, finally confronts him. Of their four grown-up children, Ellie, herself once abused by Hal, had sought to find strength by moving away, and now discovers it back in the midst of her family. Cal, the youngest son, is a lawyer whose instinct is to defend Hal—until he becomes a father himself. And Becky, unconsoled by the parties and gifts her parents give her, and suspicious of the therapist she is now required to see, keeps her rage hidden—and nearly tears herself apart. 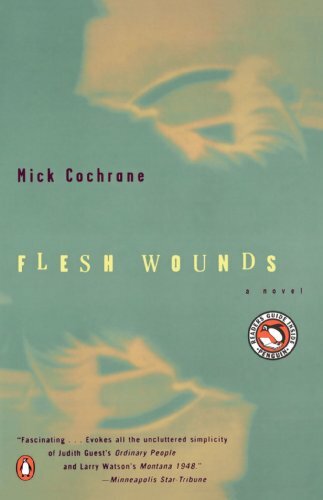 Flesh Wounds is about family, and the tangled, tender, painful, ambivalent nature of our feelings toward those who have both loved us and hurt us the most. "Flesh Wounds—coherent about that huge incoherence we call family love—caught me up the way he exposed crankshaft of a huge truck will, if you get too close to it: quickly, painfully, and irrevocably. Just what you want in a novel. Well done." "In this fascinating family story, right and wrong are shaded with unforgettable moments of spirit and light, sweetness and mercy. Mick Cochrane’s compassion for his characters sustains and rescues them, and makes this book a gift." "Even more impressive than the sure hand which Mick Cochrane tells the story of this most wrenching of domestic violations is the remarkable gift he has for assuming the voice of his female characters: More than once I had to remind myself this was written by a man!" "This story of family secrets, rich in detail and character, unbearably honest and moving, reminds us that family life can be as dangerous as war, requiring courage and heart to survive. Which ultimately happens to the family in Flesh Wounds, leaving us with a sense of their triumph and capacity for humanity."